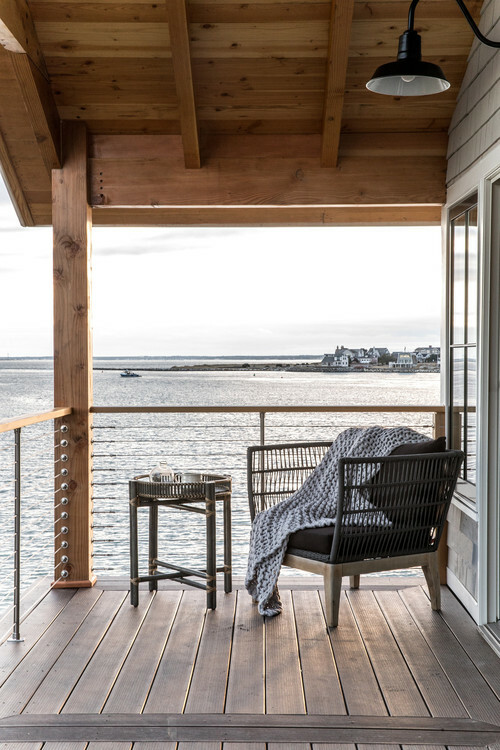 Today we’re traveling to Portland, Maine to tour a renovated waterfront home with views and decor that will leave you feeling refreshed and inspired! 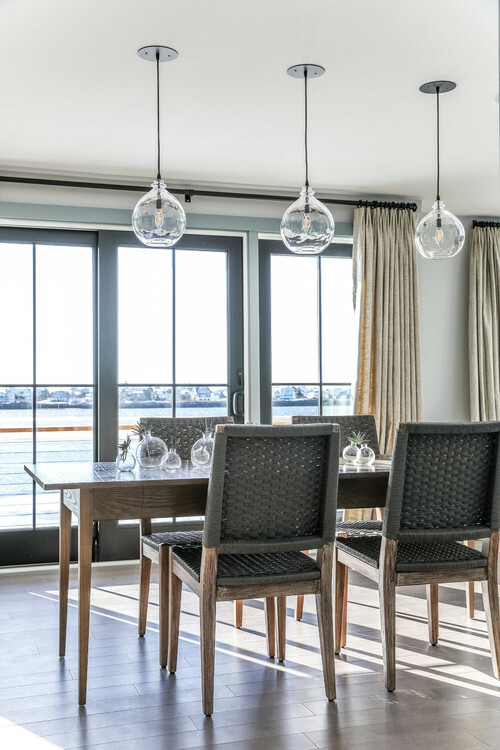 Upon entering the renovated waterfront home, you get an immediate sense of the light-filled spaces that grace the home’s fresh interiors. 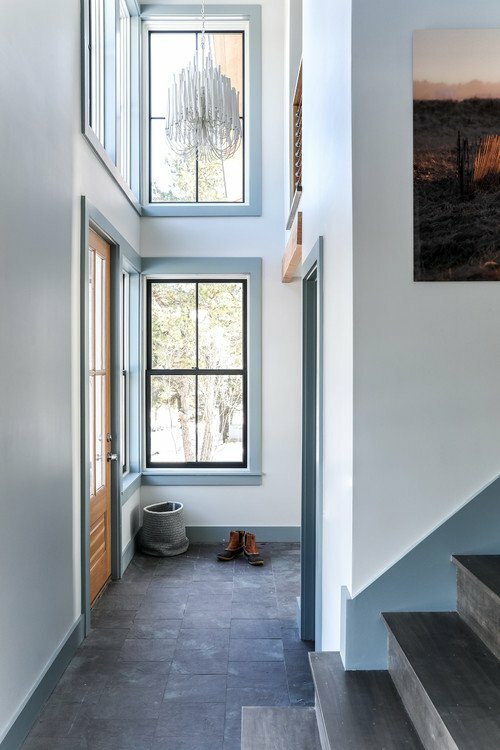 I’m a huge fan of the two-tone window treatment and the light fixture reminds me of suspended candles. I would imagine everyone would fight to sit at the side of the dining room table that faces the waterfront view! Woven chairs lend coastal style while glass orb-shaped lights mimic bubbles in the sea. 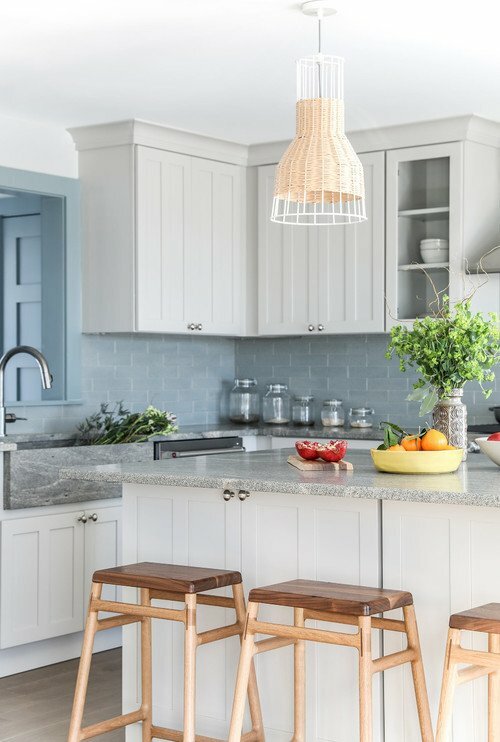 The coastal kitchen continues the light and airy decorating theme with soft colors and a rattan light fixture. Soft blues and grays echo the colors of the ocean. You’ll find the same two-toned windows in the living room with its rustic stone fireplace and other organic textiles. 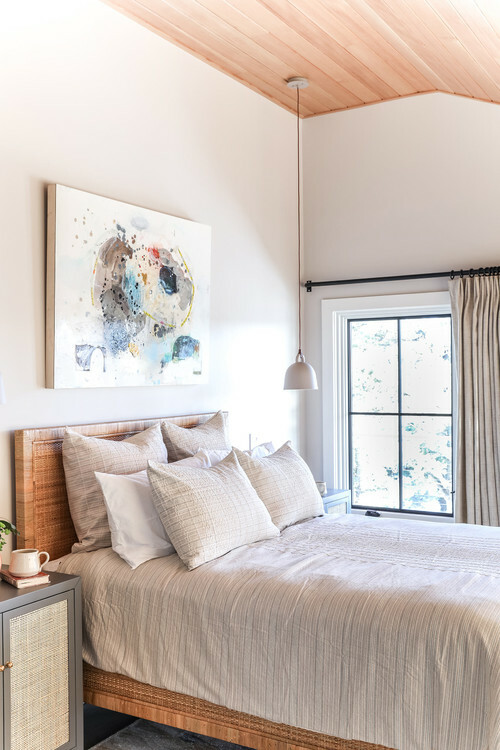 A pale wood ceiling paired with off-white walls creates a peaceful bedroom. 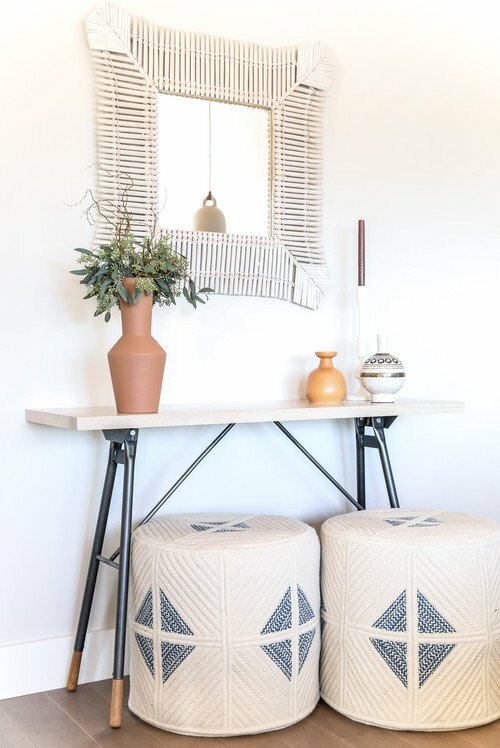 Note the use of texture in the headboard and side table. 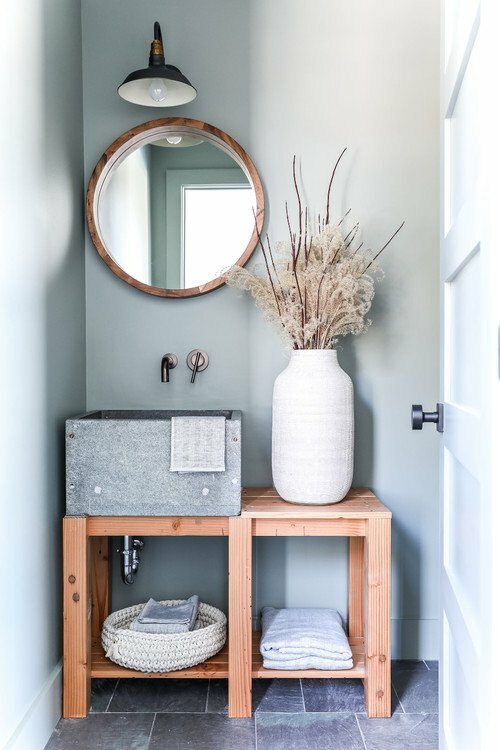 A porthole style wooden mirror calls to mind the window of a ship in the pretty bathroom with a cement sink atop a simple wood vanity. 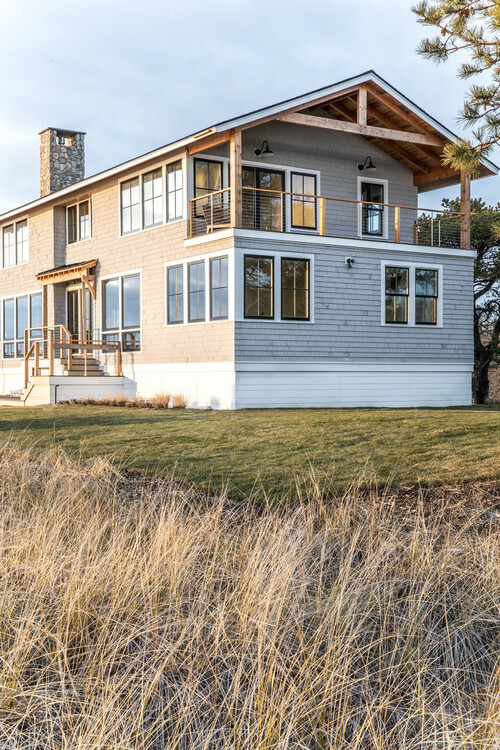 The pretty waterfront home enjoys numerous windows to drink in the amazing views outside. 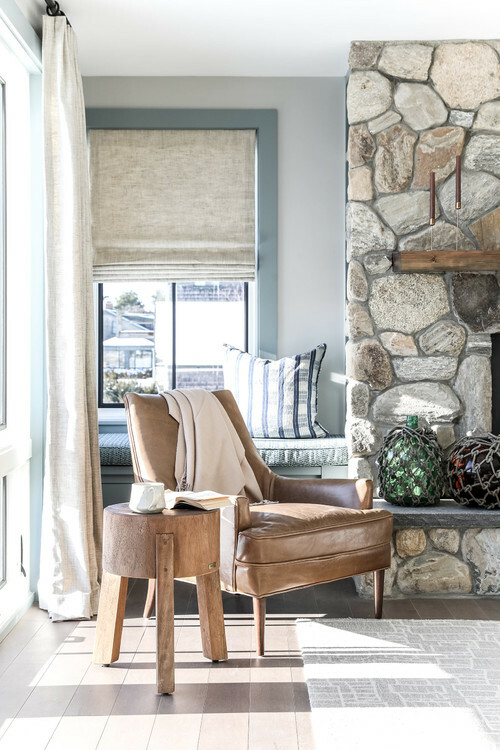 You can see more rooms in today’s waterfront home by Tyler Karu Design + Interiors over at Houzz. I was surprised for such a beautiful house on the inside the outside looked kinda of boxy. No character at all. so wonderful simplicity!! the house I really would like to have…..congratulations!!! You will find me sitting in front of that window in the corner by the fireplace, perfect place for morning cup of tea. Thanks, very dreamy. Looks like a very peaceful place to be. Only thing I really didn’t like was that cement sink. But thought it was very nice overall. Thanks for sharing this.